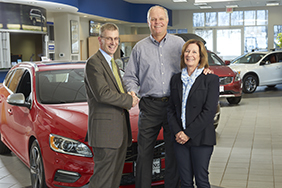 John Swedberg (L), Senior Vice President, Commercial Loan Officer at Meredith Village Savings Bank meets with Rich and Linda Lovering, owners of Lovering Volvo. *Checking Accounts are variable rate accounts. *Fees could reduce the earnings on Checking Accounts. *An active business checking account in good standing is required. Your associated checking account is “active” with 3 or more withdrawals or deposits within each statement cycle.